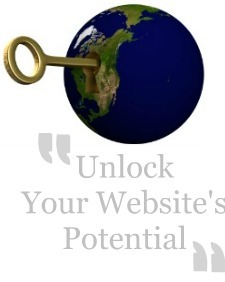 "Your home page is the key that unlocks a world of opportunity." A website's home page is the first impression that visitors from around the world will have of your website. Make that impression an amazing one! State the purpose of your website. Describe the benefits for visitors. Specify how you website will deliver the benefits. A home page should quickly convey your message to create immediate interest. You only have a few moments to capture the attention of your visitors so be clear, be concise and be compelling. All in a few scrolls of the mouse. Yes, a business home page needs to be short and sweet! You need to create the best home page on the internet! When you prepare for an interview what do you typically do when you want to make a great impression? Why you pick out your best professionally tailored outfit, you put extra effort into spit shining your shoes, you stand tall and straight, turn on your warmest, most engaging smile and look your interviewer right in the eye as you extend your hand in a big friendly confident greeting. Right? You need to accomplish the same effect when you build your own home page! Your home page needs to be welcoming, attractive, straight-forward, engaging, helpful, and offer an enticing benefit to your visitors. Put the two to four keyword phrases you carefully selected that clearly represents your site theme in the title, description, and strategically used throughout the body of your home page. Use a tag line to summarize your website objective. The headline should clearly state the intention of your site. Offer a short introductory summary to expand upon the site purpose and the valuable benefits it offers. Build trust right away. Focus your sincere, honest and warmly delivered description on how your site will provide the answers that address the needs of your visitors. Build a scannable page using short, captivating headlines to summarize major points and ample space between short paragraphs to allow visitors to quickly absorb your message. Be sure that paragraphs are short yet adequately summarize the benefits your site offers. You need to distinguish what value your site offers that others do not. Strategically use links to direct visitors to other web pages for more information rather than using your home page to address every single detail. Use only enough meaningful graphics to create visual interest and to highlight the site's purpose. Leave the flash and animation to tier two and three pages. You have just created the most perfect invitation addressed to the entire world who will now be enthralled with your specialized niche and expertise. How about that? Other than a bit of tweaking here and there, you can now relax. You've just started your most perfect dream job. You can even trade in that perfectly tailored business suit for your most comfy P.J. 's because building a small business website is one of the few dream jobs where you can actually go to work wearing your most comfy pajama's! Remember that the ultimate purpose of your home page is to provide your visitors with compelling information about the purpose and benefits of your site. Hey, have you met Bits and Bytes yet?